Tonight we fired up the grill for a totally summer meal. Dinner consisted of a grilled New York strip steak with thyme and bleu cheese. The steak was accompanied by a quinoa salad filled with fresh veggies and tossed with a thyme lime vinegarette. Glistening Food PornT: mmmm the quinoa salad was good! A: the whole thing was just damn tasty in my opinion. the steak was kind of heavy and the salad lightened it up. 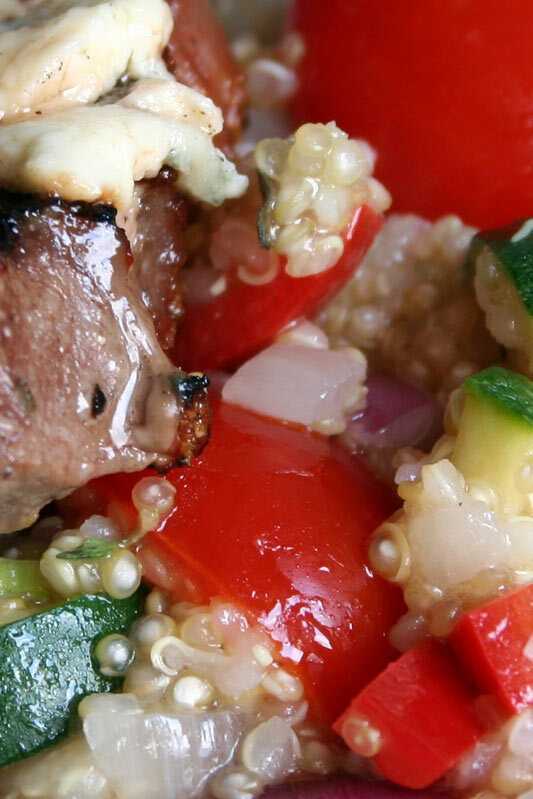 T: the quinoa salad was good enough that it completely overshadowed the steak… not to say that the steak wasn’t good. I was taken with the salad though. T: welcome to the 21st century, woman. Where women do all the work and we men sit around and eat quinoa, tofu, and… make cookies. T: -not true! I’ve used the kind that come in a roll and you have to portion them yourself! A: Oh…touche I am soooooo wrong! T: Let’s armwrestle. right now. T: muscly-armed man? wonderful, intelligent, muscly-armed man? A: ha! testosterone laden cave man MFer. 😛 but you are my muscly armed paperboy! T: that’s what I thought, cavelady. Well, want to rate the meal? A: definately! This meal cried summer to me. A light refreshing salad, a steak cooked over a charcoal grill…bleu cheese and thyme. okay, maybe bleu cheese isn’t so summery but hey! i love it. I give this meal a 4.5/5. It really hit home for me. T: I give the meal a 4.55/5. The quinoa salad set it off. If I were rating the quinoa salad alone it would get a… 4.76/5. You gotta post a recipe for it! The world must experience this quinoa salad! A: I definately will. Tonight. I should have plenty of free time while doing nothing at work for 7 hours. T: That salad was so damn good. It’s all time. A: woah now southern boy. what’s this cali speak coming from your mouth? A: i assume you hear these phrases everyday. No crazy surfers where i work. T: no crazy surfers? that’s weird. All time. Cooking quinoa is simple. It is a 1:2 ratio just like rice, meaning one part quinoa to two parts liquid. Start by sauteing 1 small onion and 1 clove garlic in a couple tbsp oil over medium heat, until translucent. Add the quinoa and stir. Allow the quinoa to toast, stirring until you start to see a little bit of a color change. Turn the heat to high and add two cups of water and a liberal pinch of salt and pepper. Bring the quinoa to a boil then reduce heat and simmer until all the liquid has cooked out. Stir occasionally. When the quinoa is finished pour it out onto a baking sheet to cool for 10 minutes. Combine all the chopped veggies and slightly cooled quinoa in a large bowl. In a separate bowl, add the lime juice and zest, honey, dijon, and thyme. Whisk until thoroughly combined. Continue to whisk while slowly drizzling in oil, in order to emulsify. Add as little or as much oil as you like depending on how tart you like your vinegarette. I prefer a pretty tart vinegarette so I do a 2:1 oil:acid. Finish the salad by pouring on the vinegarette and folding it into the salad. Chill for at least 3O minutes then taste and season with salt and pepper as necessary. Serve chilled. Enjoy! Quinoa scares me (though I DO like to say it…quinoa, quinoa…you can’t tell, but I’m saying it). I had it once and it was just bumpy and weird. 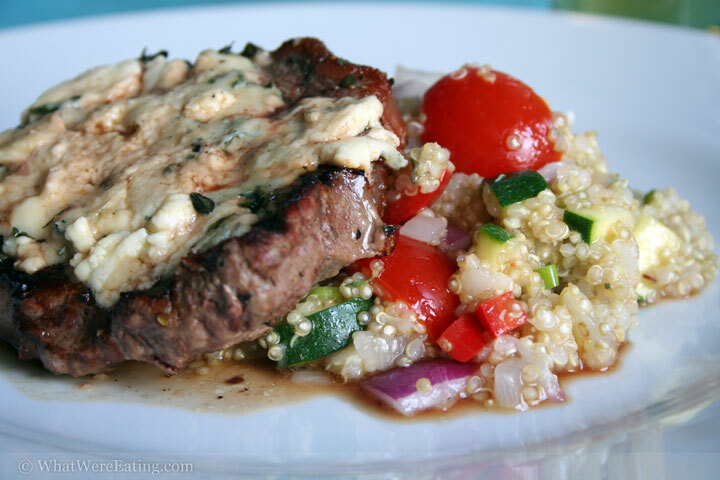 Grilled steak with bleu cheese and thyme…now that sounds fantastic! Oh, the quinoa salad sounds amazing. Can’t wait to try it – thanks! Lea, quinoa doesn’t need to look like punishment food! (just add lots of a yummy vinegarette and fatten it up a bit! you could throw some cheese in there too. At Harvest (a restaurant i used to work at) we made a pretty damn tasty black bean, corn and quinoa salad. It’s a world of endless possibilites. Rorie, no problem! i hope you like it! Thanks Keiko! I hope the bbq went well. actually, for you, i don’t need to hope. you are an amazing cook, so i know the bbq went well! Sounds like a great recipe. I just read somewhere that one cup of quinoa has more calcium than a quart of milk. Good protein and one of the oldest and easily digestable grain.